Enjoy hours of peaceful serenity and “lazy days” in this newly completed, charming three story Seacrest Beach vacation home that provides a glimpse of the gulf from covered balconies on the third level. The interiors are decorated in a comfortable country style that exudes warmth. Two toned, honey blonde hardwood flooring flows throughout creating the warm natural ambiance. A columned covered porch serves as the entry that leads to the comfortable master suite with its own private bathroom. The bedroom is appropriately decorated in soft serene colors of cream and pastel blue. A guest room with a queen sized bed on this same level is decorated in cheery colors and has access to a full hall bathroom. Upstairs you’ll find the sunny main living and dining area tastefully furnished in a cottage style with a wall mounted flat screen TV. Two sets of double panel glass doors lead out to the covered porch where you may catch a glimpse of the gleaming gulf in the distance while enjoying cool beverages and delightful conversations. The open kitchen has a rich mottled gray counter top, a breakfast bar with two seats, a glass flat top range and a side by side stainless steel refrigerator. A partially open stairway leads up to the third floor that has a twin bunk room with a full bath and a nice den with a sleeper sofa, television and a wet bar with a refrigerator for refreshments. Glass doors lead out to the third floor balcony for bird’s eye views of the scenery below. This vacation home is minutes away from the crystalline white beach as well as the lavish 12,000 square foot Seacrest community pool that has splashing fountains and lush tropical landscaping. Yes indeed, here you will enjoy your own lazy days in South Walton. 12,000 square foot lagoon pool. 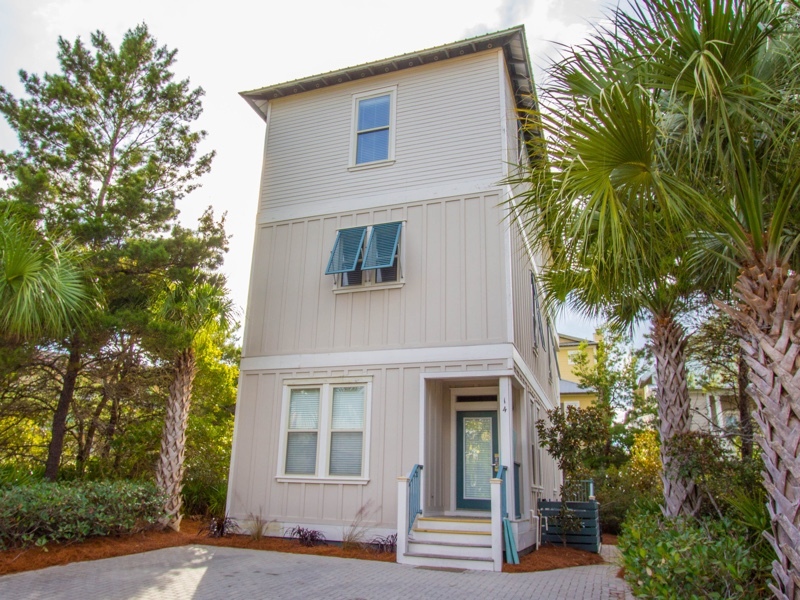 Right off of scenic 30A in the beautiful community of Seacrest Beach! Close to Publix, Winn-Dixie, Yogurt Shoppe, many restaurants and spa. Golf at nearby Ocean Club or Sandestin Golf courses.